Have you realized that you spend too much time cleaning out your CNC machine? Do you find that It is messy and backbreaking work? Do you spend too much money replacing the coolant in your system? If you answer yes to any of these, EXAIR has a product for you; the Chip Trapper System. EXAIR created this product to reduce the down time and extend the life of your coolant. This device will save you money and time with productivity, coolant, and repairs. In this blog, I will go over some of the features and benefits with the Chip Trapper Systems. EXAIR offers two types, the Chip Trapper and the High Lift Chip Trapper. They are designed to move fluid into the drum to be filtered, and to allow the clean fluid to be placed back into the sump. The Chip Trapper works great for quick coolant cleaning at the floor level. The High Lift Chip Trapper is ideal for cleaning viscous fluids as well as for reservoirs below the floor level. Both types use a pneumatic two-way pump to move the fluid. They come in three different drum sizes, 30 Gallon (114L), 55 Gallon (208L), and 110 Gallon (418L). So, you can clean large sump tanks with only one cycle through the cleaning system. They come standard with a 5-micron bag filter that can hold over 5 gallons of material. EXAIR can also offer filter bags in 5 other micron ranges from 1 micron up to 200 micron. And if you are not sure on the other filtration ranges, EXAIR offers a filter sample pack, model 901060-SP, that includes one of each type. The Chip Trapper System includes the drum, the two-way pneumatic pump, a drum dolly, a directional flow valve, 10 feet (3m) of vacuum hose, 20 feet (6m) of compressed air hose, a chip wand, a shut off valve, and two additional filter bags. All you need to do is to attach the Chip Trapper System to a filtered compressed air source. The High Lift Chip Trapper offers a more powerful pneumatic pump which can fill a 55 gallon (208L) drum in 85 second from 15 feet (4.5m) below. And, instead of the 10 feet (3m) vacuum hose, it will come with a 20 feet (6m) vacuum hose. The unique features with the Chip trappers are the abilities to clean the CNC sump very quickly and with less mess. Also, by using compressed air to pump the coolant in and out of the drum, it will aerate the coolant. This will reduce bacteria growth and extend the life of the coolant. Thus, saving you money with those more expensive coolants. Another benefit is that the pneumatic pump does not have any moving parts to wear out. So, it will last you a long time without worrying about motor failures or loud noises. The number of complete coolant change-outs are reduced. The speed to get the CNC machines back operational to make parts. Reduce the number of barrels of coolant concentrate per year. Bacterial growth dramatically reduced as the Chip Trapper aerates the coolant. Filter bags will remove the chip fines and some tramp oils keeping the coolant fresh. A complete system that is easy to use. As an added note, some CNC machines come with a spindle coolant feature. This new technology helps in the need to increase speeds and feed rates. The coolant is pumped to the top of the machine and fed directly through the spindle. This type of spindle uses a rotary union which allows the coolant to the spindle as it spins at a high rate of speed. The rotary unions are very expensive and costly to replace. These spindles are very susceptible to dirty coolant. If a seal within the rotary union begins to leak inside the machine, you will not be able to diagnose the problem until they have a machine failure. The Chip Trapper with help eliminate this chance and keep your machine from an extreme expensive breakdown. When your machine is not operating, your productivity is lost. The EXAIR Chip Trapper Systems can be that product for you to get you back up and running is a short period of time, extend your coolant life, and keep the area clean and safe. A win-win proposition in saving money and time. For U.S. and Canadian customers, EXAIR offers a 30-day unconditional guarantee to try. And, for a limited time. an end-user will get a free EXAIR Vac-u-Gun, a $112.00 value, with any purchase of a Chip Trapper or High Lift Chip Trapper. 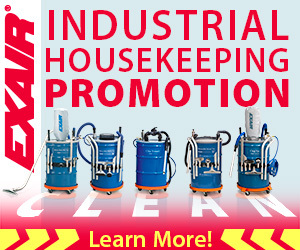 If you want to learn more about the EXAIR Industrial Housekeeping Products, you can contact an Application Engineer. We will be happy to help you. You can use a pump. Some pumps are even made to mount straight onto the lid of the drum. You can siphon the liquid out, if you can get the drum higher than where you want to put the liquid. And if you have the time. You can turn the drum over. I used to do field service in chemical plants…some of them had drum handlers on fork trucks that could pick up and tilt the drum to pour the liquid out. Some of them pushed the drum over and simply let the liquid spill into a pit or below-grade sump. But pumps break down. Siphoning is finicky and slow. I’m loath to knock the skills of the fork truck operator that can pour out a drum like a sommelier pours a fine wine. And I’ll never forget the first time I saw an operator half-roll/half-dance a drum to the edge of that pit and let the liquid dump as he dropped it precisely where he wanted it…however, even in the context of the inner recesses of a chemical plant, it was simple, but inelegant. EXAIR has an engineered solution that preserves the simplicity, though: the Reversible Drum Vac. Thread the standpipe into the bung connection and the RDV itself into the vent, and that drum is now a two-way pumping system, able to be emptied via a 10 foot long Vacuum Hose in as little as a minute and a half. Turn the knob on the RDV to switch modes, and you can fill that same drum just as fast. With a simple turn of the knob, the Reversible Drum Vac can fill or empty a 55 gallon drum in 90 seconds! Made to fit an existing 30, 55, or 110 closed top steel drum in good condition. Mini Reversible Drum Vac System comes with a 5 gallon drum. Deluxe Systems add a Drum Dolly and a set of tools. Premium Systems add a drum (30, 55, or 110 gallon,) an upgrade to Heavy Duty Aluminum Tools, and a 20ft compressed air supply hose with shutoff valve and pressure gauge. High Lift Reversible Drum Vacs generate a suction head of 180″H2O for maximum lift. They’re also specified for higher viscosity liquids. Below is a great video that showcases just how easy it is to from installing the Reversible Drum Vac to using the Reversible Drum Vac and just how fast the RDV operates. If you’re looking for a fluid handling solution for liquids in drums, give me a call and we’ll talk about which Reversible Drum Vac System is right for you. One Christmas, a long time ago, my Mother In Law gave me a beautifully wrapped present, and a great big smile. I opened it up…it was an extension cord. One of those heavy duty orange, indoor/outdoor, 100 foot long models. I returned her smile, while thinking about all the things I might be able to use it for…and not coming up with anything really solid. If I give someone a battery operated gift, I give them batteries too. If it comes with its own rechargeable battery, I carefully open the package and charge it up, before I wrap it up. If accessories are available, I think about how they might use it. I’ve even presented them with the accessory first, in tribute to my wonderful wife’s wonderful Mom. If there’s a “deluxe” or “premium” version, sometimes it’s worth it to just go all out…again, after consideration of how they might use it. Now, this is not only the case with presents…many household, commercial, or industrial products offer Deluxe or Premium packages…like the EXAIR Chip Vac System. At the most basic level, a Model 6193 Chip Vac System for 55 Gallon Drum is all you need to turn an existing drum into a powerful, reliable, durable industrial vacuum. It comes with a lid & latch ring, Filter Bag, 10 foot vacuum hose, a set of plastic tools, and of course, the Chip Vac itself. All you need for simple, on-the-spot cleanup purposes. Model 6193-30 is also available for your existing open-top 30 Gallon Drum. Sometimes you might have (literally) more ground to cover: the Model 6293 Deluxe Chip Vac System adds a Drum Dolly for mobility, and a Tool Holder to keep the attachments handy. Deluxe Chip Vac Systems come with a Dolly and Tool Holder in 5 Gallon (left,) 30 Gallon (center,) and 55 Gallon (right) sizes. Other times, you may just be looking for a complete system, ready to handle everything, right out of the box. Enter the Model 6393 Premium 55 Gallon Chip Vac System, which adds a heavy duty steel drum, an upgrade to Heavy Duty Aluminum Tools & Static Resistant Vacuum Hose, and a 20ft Compressed Air Supply Hose with Pressure Gauge & Shutoff Valve. Premium Chip Vac Systems are ready for any cleanup job, right out of the box, and come with 30, 55, or 110 Gallon Drums. Or, if you’re looking for something lightweight & compact, the Model 6193-5 Mini Chip Vac System comes complete with a 5 gallon drum, and the Model 6293-5 Deluxe Mini Chip Vac System adds a Drum Dolly. The Mini Chip Vac System comes complete with a 5 Gallon Drum, and the Deluxe System adds a Drum Dolly for mobility. With no moving parts to wear and no electrical components to burn out, the EXAIR Chip Vac is a virtually maintenance free replacement for noisy, damage-prone electric vacuums. If you’d like to find out just how handy they are, give me a call. Have you ever heard an electric vacuum toward the end of its life? It gets an irritating high-pitch noise caused by the bearings going out. A customer was hearing this annoying sound after only two months of use. Their application was shot blasting metal parts. The shot blast media was very dusty and carried everywhere around the room. After use, they would use a shop vac to clean the machine and around the area. When they started to hear that “moan” from their electric vacuum, they knew that they would have to purchase another unit. Additionally, they noticed a lot of dust migrating into the work environment from the shop vac, creating a breathing hazard for the operators. After their second electric vacuum failed, they started looking for a better choice. When they contacted EXAIR about these issues, EXAIR had a great solution for them. I recommended our model 6399, 55-gallon Premium Heavy Duty HEPA Vac System. This system comes with a drum, drum dolly, heavy duty accessories, HEPA Filter, and a robust vacuum system. The heavy-duty accessories are easy to use to vacuum in tight spaces. The HEPA filter inside the drum has an efficiency of 99.97% at 0.3 micron. So, the dust will remain in the drum and not migrate back into the ambient air. The HEPA filter media is pleated to give a large surface area of 36.7 ft2 (3.4 m2). Packed inside a supported cylindrical, it will allow for great amount of debris before changing. With the shop vac above, the surface area of the filter was very small causing the filter to plug and under-perform. The EXAIR Heavy Duty vacuum generator is made from a hardened-alloy steel construction which is very resistant to wear. It does not have any moving parts or bearings to wear. For this application, the generator is perfect for the shot blast media. The Heavy Duty HEPA Vac only requires compressed air to operate, not an electric motor which can fail from dusty environments. The Heavy Duty HEPA Vac System only has a decibel level of 82 dBA which makes it very quiet compared to shop vacs. With clean compressed air as the engine for the vacuum, this system can last for years; not months. When the company above started to use the Heavy Duty HEPA Vac, the first thing that they noticed was how quiet it operated. That constant loud noise from their electric vacuum was gone, making it a better working environment for the operators. They also noticed that the dust was not getting back into the environment, reducing the dust nuisance. If you find that your electric vacuums are breaking down or you would like to reduce the noise levels, EXAIR has a large line of Industrial Housekeeping Products. You can contact an Application Engineer to see if we have the right vacuum product for you. I had the pleasure of talking with an operator in a power generating plant recently. A small sump, in a hard-to-access location, needed to be emptied periodically, or it would overflow and make a big mess. They didn’t have room for a “great big” (his words) 30 or 55 gallon drum, and it was difficult to use an electric shop vac because there wasn’t an outlet nearby (it’s a very humid location in the steam plant) so they had to rig an long extension cord through a doorway and down to the lower mezzanine. They DO have compressed air available…in fact, there was an unused port on a manifold that supplied other pneumatic equipment, right next to the sump. He thought it sounded like an ideal application for the Mini Reversible Drum Vac. And it was. They put a Model 6196-5 Mini Reversible Drum Vac System on the floor, next to the sump, and empty it (usually 1-2 gallons) on the night shift. They also got a 6569-20 20ft Vacuum Hose, which they use to pump the drum contents into an internal drain system. No more hassles with the electric shop vac and extension cord. No more overflow messes. The most they have to do now is change to the 20ft hose when they empty the drum. If you’d like to find out how an EXAIR Intelligent Compressed Air Product can make your life easier, give me a call. Our Industrial Housekeeping vacuums utilize compressed air energy to create a powerful and effective vacuum capable of with standing the harshest of environments. These vacuums have no moving parts to wear out or replace, run quietly and are built to be placed upon your own drum or may be purchased with a drum. EXAIR has three dry/solid vacuum systems available they are the Chip Vac, Heavy Duty Dry Vac and the Heavy Duty HEPA Vac. The EXAIR Chip Vac picks up wet or dry chips and delivers them directly into an ordinary open-top drum. The Chip Vac is used to clean chips from fixtures, floors and work surfaces of machining centers, lathes, saws, mills and other industrial equipment. The Chip Vac is the ideal choice for quick and efficient cleaning. The Chip Vac can also be used to vacuum wood or plastic chips and can be used occasionally for dusty materials since it incorporates a filter bag to keep the surrounding air clean. The 30, 55 & 110 Gallon Chip Vac’s consume 40 SCFM @ 80 PSI while the 5 Gallon size consumes 33 SCFM @ 80 PSI. All 4 models are rated at a super quiet 77 dBA! The Heavy Duty Dry Vac like the Chip Vac can attach to ordinary open-top drums. Designed to withstand tough industrial environments the proprietary hardened alloy pump deliver powerful performance with superior abrasion resistance. They are used for a wide variety of applications that include abrasive materials such as steel shot, garnet, metal chips and sand! Please know that while very powerful it is still suitable for general applications such as vacuuming floors, machines, work stations and industrial equipment. The 30, 55 & 110 Gallon Heavy Duty Dry Vac’s consume 68 SCFM @ 80 PSI and have a sound level of 82 dBA. Finally the Heavy Duty HEPA Vac has the added benefit of the HEPA quality filter system. Filtration per IEST-RP-CC-007 to 99.97% minimum filtration at the 0.3 micron level ensures performance meets the needed criteria. Like the Chip Vac and the Heavy Duty Dry Vac it will attach to ordinary open top drums as well. The 30, 55 & 110 Gallon Heavy Duty HEPA Vac’s consume 68 SCFM @ 80 PSI and have a sound level of 82 dBA. 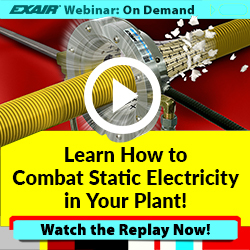 When you look at the EXAIR vacuum producing units, you will notice there is not an electrical cord. That is because the EXAIR Industrial Housekeeping Products utilize compressed air for operation, therefore they do not have the same issues with wear, breakdown and failures as electrical type vacuums. Quite simply there are no moving parts in the vacuum units to wear out or break. They are maintenance free, just make sure the air supply is clean & dry, and they will operate for a long time due to the fact that there are no motors and bearings to wear out and no impellers to clog. If you would like to discuss Industrial Housekeeping or any EXAIR product, I would enjoy hearing from you…give me a call.